If you have ever wanted a wedding that looks like it’s right out of a magazine, any Fairmont Location is the perfect choice for you. A venue steeped in tradition, it offers a grand-style setting that is classically royal and elegant. The Fairmont hotels are the premier choice if your style is softly romantic, trend setting modern and or show stopping elegant. The Fairmont is a landmark hotel and one of the most iconic hotels in the world. We are lucky enough to have four of them in Vancouver! We have been able to shoot some glorious weddings at each. Primarily shooting at Fairmont Waterfront and Fairmont Hotel Vancouver. Known for their luxury and grand architecture, indoors and out. The Fairmont will make sure to satisfy your every need, especially aesthetically in images. Depending on which location you choose, each has it’s own unique quirk. For example, Waterfront Hotel has stunning ocean views with majestic Coastal Mountains as your stunning backdrop on an intimate garden terrace. You also have the more traditional and luxurious option to have your ceremony in one of their Banquet Halls, inspired by the hotel’s rich history. Fairmont Waterfront, Fairmont Hotel Vancouver, Fairmont Pacific Rim and Fairmont Vancouver Airport. Waterfront: Located on the city’s dynamic harbourfront, Fairmont Waterfront is a world class luxury hotel in Vancouver, and proudly embraces a sustainable philosophy. We offer upscale comfort, personalized service, and unparalleled West Coast views, with easy access to everything that makes Vancouver spectacular. With sweeping ocean views and the majestic Coastal Mountains as your stunning backdrop, our harbourfront hotel is the perfect location for your perfect wedding. Choose a small, intimate garden terrace ceremony, or a grand ballroom gala, then spend a magical, romantic night with your true love in one of our exquisitely renovated harbour rooms. Hotel Vancouver: The Fairmont Hotel Vancouver is where "happily-ever-after" begins in grand style with our dedicated wedding planner. Celebrate your momentous day at the premier venue in town, The Pacific Ballroom. 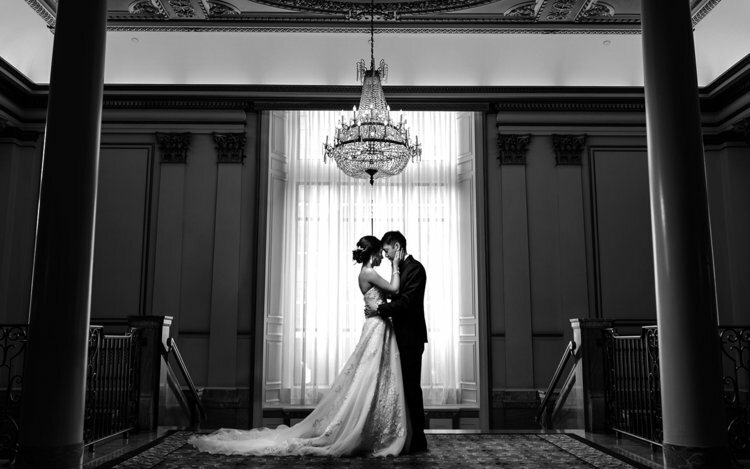 Fairmont Hotel Vancouver was recently voted "Best Wedding Venue - Hotel or Banquet Hall" by The Professional BC Wedding Awards. Whether your style is softly romantic, trend-setting modern or show-stopping elegance, Fairmont is the premier choice. Pacific Rim: Host your Vancouver wedding at the luxurious Fairmont Pacific Rim and turn your special moment into a lifelong memory. Say “I Do” to our Vancouver wedding venues that feature breathtaking views of the Vancouver harbour and North Shore mountains.